Finished Some Vanguard Veterans and one remaining Sternguard Veteran that I’ve had sitting around for awhile. All things considered, they’ve turned out pretty good. I’m not entirely finished with them, as I need to work on their tabards/togas and basing, but it’s been awhile since I’ve posted. The Vanguard Veterans are from the Space Marines Veterans set, and unfortunately I had to go with the Citadel Finecast run. To say that I am not a fan of the Finecast Resin would be an understatement. I have a Vanguard Vets Set with jump packs and despite a lot of work, the fellow with the Relic Blade still looks like he has a rubber sword. The Finecast Resin, while giving sharper detail, suffers compared to pewter or plastic. You get a LOT of mold lines, flash, and air pockets that need to be corrected, and the material is very heat sensitive, resulting in bendy arms, swords, and other “branches” from the main body of the figures. Sometimes, you can re-heat the material and bend it back into true, other times you can’t. Fortunately, with the Veterans set, I was able to repair everything. I converted the fellow with two lightning claws into a guy with one lightning claw and a plasma pistol, and the beakie with the chainsword and pistol swapped his chainsword for a thunder hammer. The Finecast lighting claws were in terrible shape, and I just wanted the fellow with the chainsword to have a weapon that was a bit more personal. Overall, I’m pretty pleased with the results. The Sternguard Veteran was from the metal Sternguard Veterans set, and I was MUCH happier working on them. I’d finished most of them awhile back, but I had lost this guy’s non-firing arm somewhere. Since I’d only needed four Sternguard to fill out a squad I’d been working on awhile back, he’d been a low priority to complete, but I figured I’d finish him with this batch of vets. I confess I probably did a poor primer/basecoat job on him, leaving him with a very coarse texture, but I wanted to get him done, so I went ahead with it. I’ve got five plastic Vanguard Veterans still to go in this batch of vets, and I have a set of plastic Sternguard, a set of Close Combat Terminators, and a set of regular Terminators still on the sprue. With the First Company guys I already have, I’m getting close to half the First Company, which is actually good! 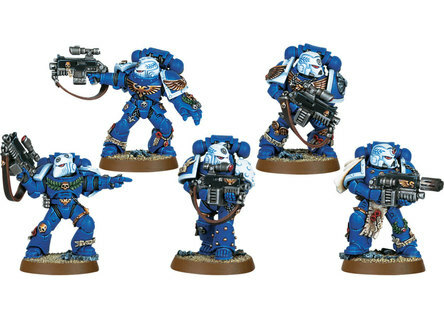 You see, I’m itching to pick up the Horus Heresy boxed games, and I need someplace to integrate a decent amount of Mk III and IV armor variants, along with 5 Catiphractii and Tartaros Terminators. This gives me good options!